This week we are talking pickles. 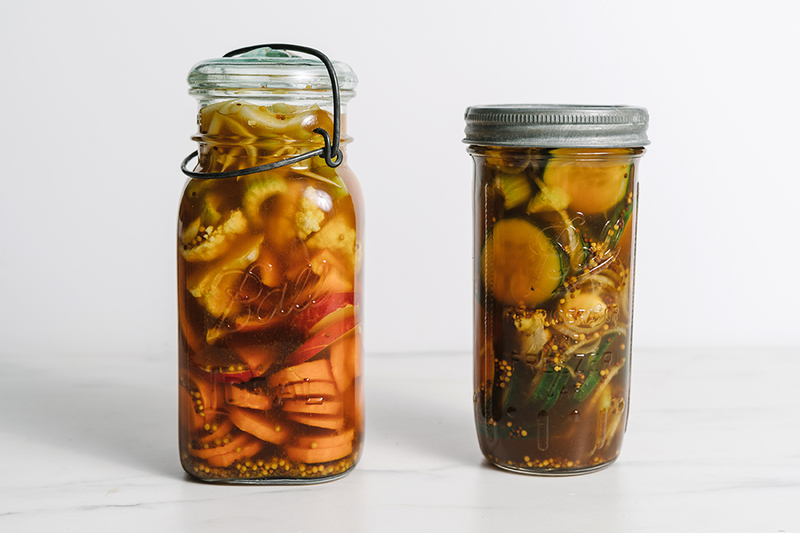 But not just your average shelf pickle, these are homemade pickled vegetables, perfect for snacking, charcuterie boards, and as a side at your next bbq. What’s so great about these pickled vegetables? They are easy to make, tasty AND they are good for you. 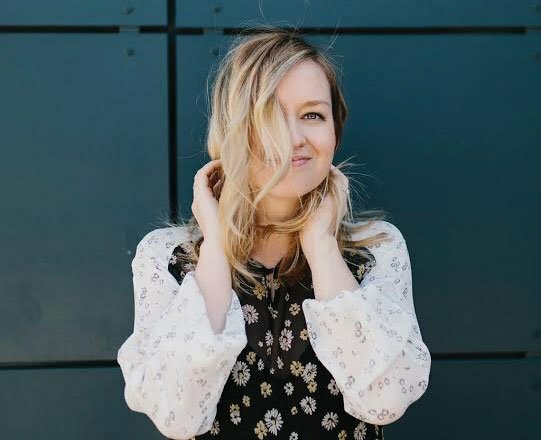 I talked a little about my health issues in my gluten free bread blog, and how changing my diet turned me into a believer that what we eat truly affects our health. 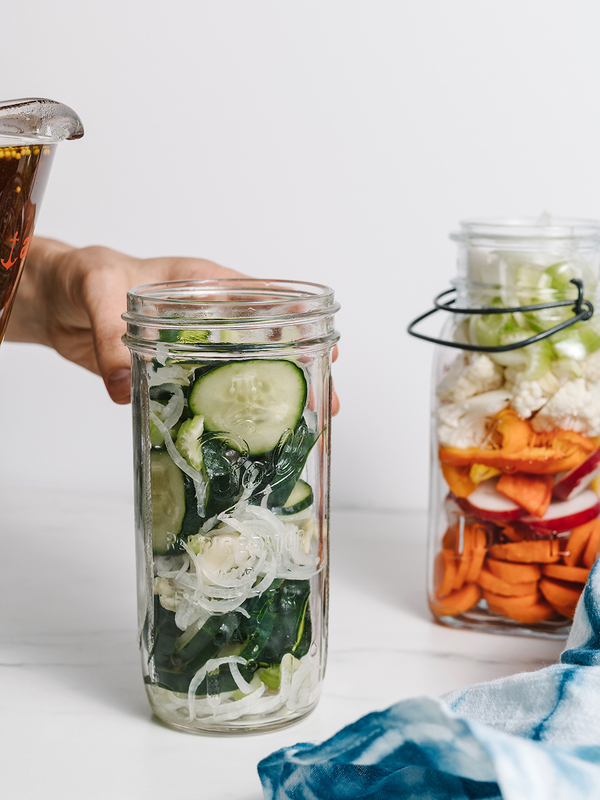 All that said, another major change I made to improve my gut health was increasing my intake of good bacteria–aka probiotics and fermented foods. The human stomach needs to be populated with good bacteria. Increasingly it is being found that where there is an absence of good bacteria, illness results. The best way of obtaining healthy stomach bacteria is through fermented foods. The problem with buying store bought goods is in order to be safe for consumption and avoid food poisoning, companies have to pasteurize and add preservatives. This kills most of the good bacteria in fermented or pickled foods. 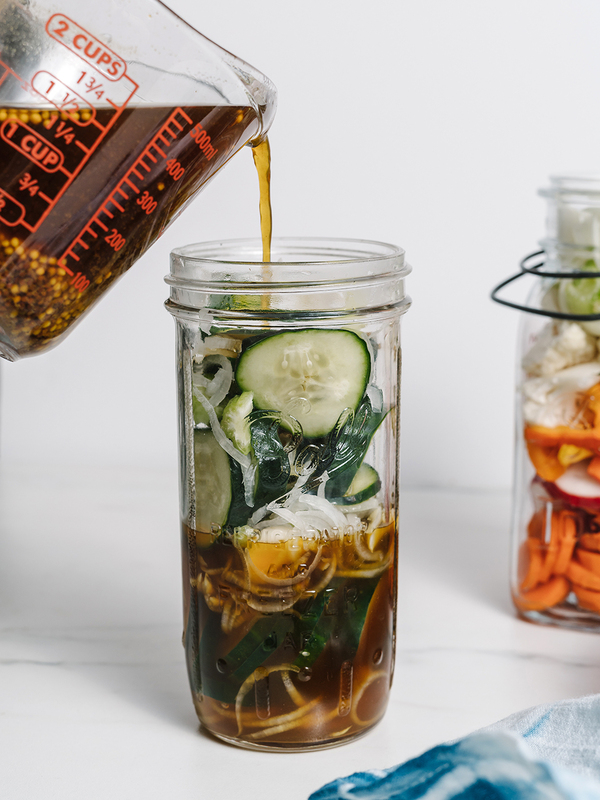 So if you truly want the full benefits of pickled veggies, it’s time to make you own! I promise it is so easy. It’s slowly becoming one of my favorite things to make because there’s endless possibilities. This recipe makes 2 quarts which is two large jars so I always have fresh yummy veggies to snack on. 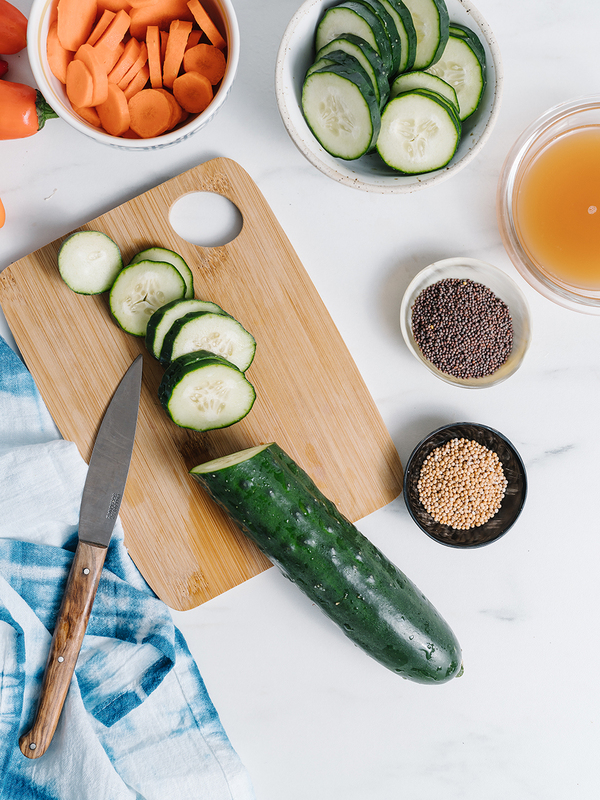 The best part is it’s so flexible, there’s so many variations of vegetables you can use this brine on and you can make it sweeter with a little more sugar, or try different types of vinegars to see what taste you like best. I’m giving you the base for great pickled veggies, but you get to make them your own! These make the cutest housewarming or hostess gifts. Just find a cute mason jar, tie a ribbon around the top and attach a sweet little note. They’ll be so impressed by your thoughtful, unique gift! 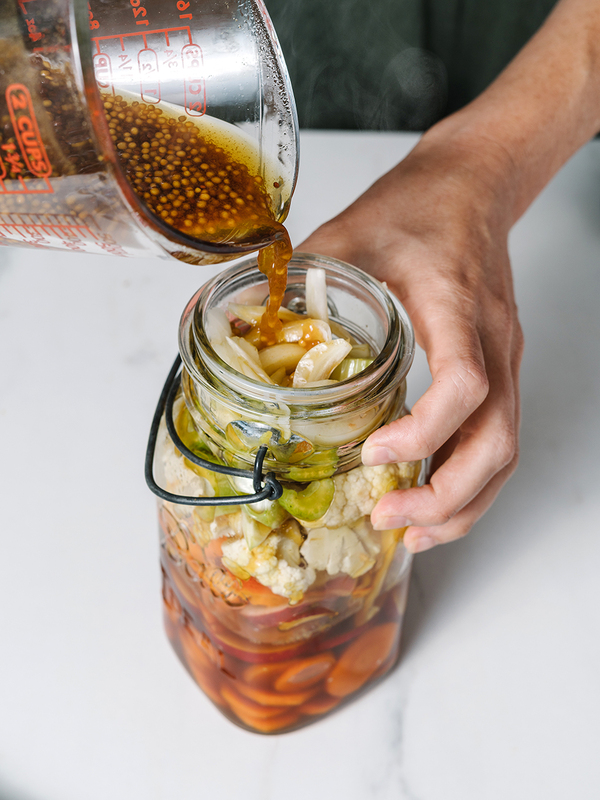 These homemade pickled vegetables are perfect for snacking, charcuterie boards, or as a side at your next bbq. They are easy to make, tasty, and are good for you. Other veggies you could try: okra, green beans, cabbage or beets. In a saucepan, combine vinegar, water, salt, sugar and dry spices in a large saucepan. Bring to low boil over med-high heat. Simmer 2 minutes, stir, remove from heat and cover. Let sit for 5 minutes. Add any fresh herbs you may like to the jar include, dill, oregano, basil, or rosemary are all wonderful additions to pickles. Fill jars with vegetables (I did one jar mixed veggies and one jar cucumbers). 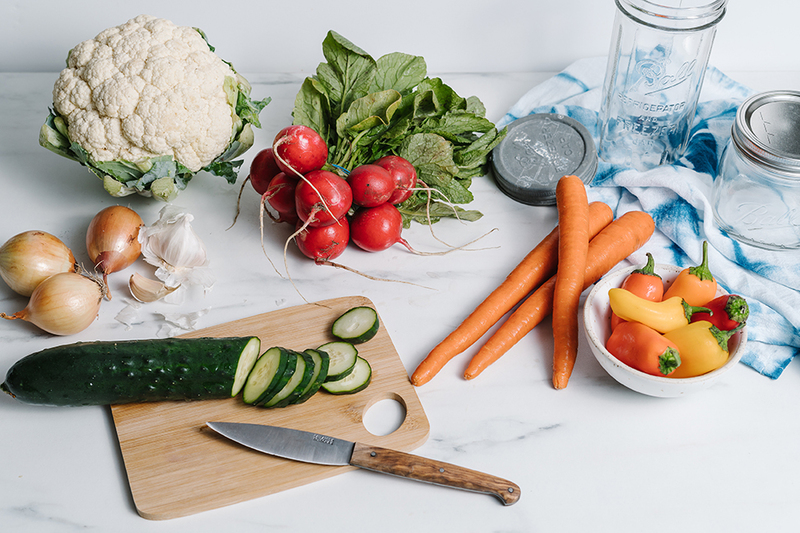 Pour or ladle brine over vegetables submerge completely, pressing down on them with the end of a wooden spoon. Be sure to leave ½ inch headspace. Let sit at room temperature for 1-2 hours and then place in refrigerator. 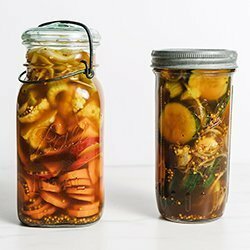 Allow pickling for 48-72 hours, then enjoy! These are good for up to 2 months under refrigeration. *Sugar is for flavor and can be adjusted to your liking. For a sweeter pickle add closer to ½ c.
To add some heat and create a spicy pickled version, add 1 sliced jalapeno to each jar and 1 tsp of red pepper flakes. This was perfect with the black bean burgers and grilled Chicken sandwiches I served to my GUESTS this weekend. This will go on my make again list!